School of Dragons company JumpStart has announced the launch of NFL Rush: Heroes & Rivals on mobile devices, giving players ages eight and up an opportunity to boost their football IQ in eight different mini-games. The game allows users to create their own football player avatar, and train their team with these games before taking it into the Redzone Rivals mode against other players. 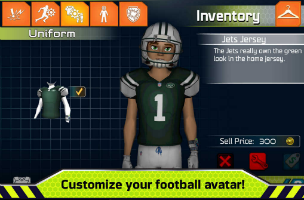 In NFL Rush: Heroes & Rivals, players choose their favorite real NFL team and create an avatar by first choosing their desired position (quarterback, running back, wide receiver and so on). The avatar serves as the captain of the player’s team, and can be customized with different hair styles, skin tones and eye colors. Once players have selected their favorite team and have created their avatar, they can take their team into training mini-games to raise their stats. There is a mini-game available for each overall position on the team, and these train the real-world player’s reaction times and decision-making skills as they learn to pass and run the ball virtually. The quarterback game, for instance, sees players tossing the ball to a receiver that runs automatically around the field. Robots will try to intercept the throws, and can even attempt to sack the quarterback, so users must aim their throws ahead of the receiver to “lead” them in the pass, or swipe on the screen to avoid a charging robot. As another example, the wide receiver game sees the team member running vertically up the sides of the screen, and players tap on the screen to make them jump from one side to the other in order to avoid obstacles or pick up points items. Power-ups are available during these games, which may freeze robotic enemies, increase the player’s points multiplier and more. These are given out for free after finishing each mini-game tutorial, but can also be purchased in the store with free currency. At the end of each game, the training team member receives experience points, eventually leading to an advancement in skills for the team. Players can compare their high scores with others on in-game leaderboards. Once back at the main menu, users can spend their collected coins on gear items for their players, which instantly boost their stats. Outside of these training games, players can enter the Redzone Rivals mode for gameplay against other real-world players. These multiplayer games see users choosing their strategy (quick pass attacks or a balanced offense, as examples), and activating power-up boosters before heading into the game. Power-ups may increase the quarterback’s intelligence stat, for instance. The first half of the game takes place automatically, and players have another chance to select their strategies and power-up during halftime. The second half also completes automatically, and players receive rewards if they win. Players must spend coins (free currency) to access these games, and can only play a limited number of games before waiting for their energy to recharge. An achievements system gives players free rewards for completing specific tasks during these games (which, again, take place automatically), or by performing tasks elsewhere in the app. NFL Rush: Heroes & Rivals is available to download for free on the iTunes App Store, Google Play and the Amazon Appstore. The game is coming soon to the Windows Store.